‘Performance’ vs. ‘evidence’ in negotiations and debates: an ancient tension. On this are depicted a whole range of Greek ‘proto-scientists’ and philosophers, although scholars argue about exactly who is who in some cases. (Islamic thinkers and Zoroaster are also depicted but the Greeks dominate). 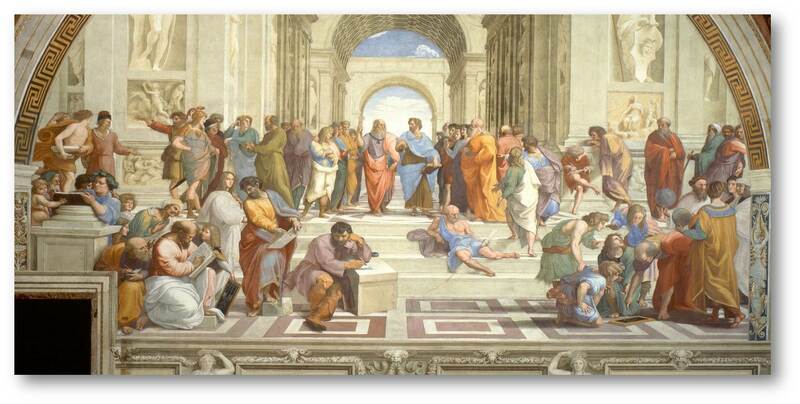 In the centre of the picture you have Plato and Aristotle, the two most important and prolific philosophical writers from classical Greece and to the left, in green, we seem to have Socrates. The picture depicts something that never could have happened in reality. You couldn’t really have Heraclitus, Socrates and Aristotle looking roughly the same age, hanging out together and arguing about philosophy because the dates and chronology just don’t work. But by imagining all these thinkers in dialogue with each other Raphael distils and emphasizes the spirit of what is now known (albeit problematically) as ‘Renaissance humanism’. Humanists sought to create a citizenry who were eloquent in speech and writing. They imagined that this would encourage engagement in civic life and the persuasion of others towards virtuous actions and wise policy. The primary texts to be used in such a project were the Greek poets, historians and philosophers. Now, I think he humanists were right about the Greeks here. They did indeed realize that public, evidence-based reasoning and deliberation were key to problem-solving and our own collective and individual flourishing. 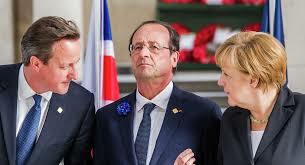 What the Greeks had to say about this was sophisticated and important. For the most part, we moderns no longer appreciate the salience of this material for our current situation. But, of course renaissance artists, thinkers and writers didn’t study the Greeks in a passive, unquestioning way or seek simply to imitate or reproduce their findings. For a start, there was a need to make pagan philosophy compatible with the goals and teachings of Christianity: this fresco shouldn’t be taken too far out of its specific context as a counterpart and complement to another fresco in the same room depicting theological disputation. And in many cases renaissance thinkers criticized or went beyond the Greeks, especially in the area of natural science. The fresco displays and projects that spirit of active questioning of previous models too. For example, Plato is pointing upwards with his cosmic mind-blowing dialogue the Timaeus under his arm and his pupil Aristotle is pointing downwards with the more practical down-to-earth Nicomachean Ethics in his hand: and if you read Aristotle on rhetoric or tragedy, you’ll see how far the latter pupil disagreed with and tried to do something very different to his former master. Furthermore, note the many other angry faces, aggressive physical gestures and posturing on the fresco. So, Raphael’s image partially undermines its own optimism by hinting that the realities of deliberation, debate and enquiry are painful, fractious, antagonistic and difficult – that ideas and arguments can be excluded, sidelined or superseded and that consensus may not always be possible, absolute or even desirable. Raphael captures the point that public deliberation, debate and argument are never purely or only constituted by the logic of the speakers’ arguments themselves or the quality and relevance of the evidence which they deploy to prove and illustrate their points. In addition to this, there is a performative dimension: how we use our voices and hand-gestures for emphasis, the way we turn our gaze, what we are wearing, whether we make our arguments more palatable and persuasive with rhetorical devices, jokes, anecdotes, metaphors, analogies, colourful language and props – whether we go personal and ad hominem with our rivals or opponents to leverage our audience’s support. ‘The Age of Pericles’, by Philipp Von Foltz (1853) (Maximilianeum, Munich). 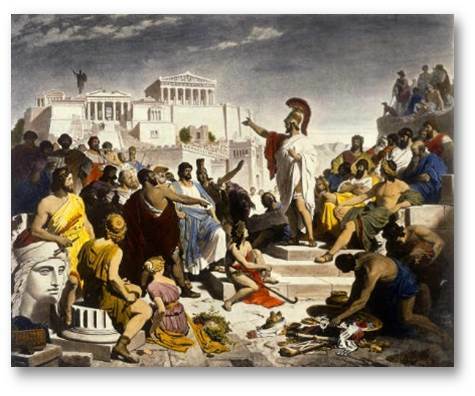 Pericles is depicted delivering a speech on the speaker’s platform on the Pnyx, the meeting-place of the Athenian democratic assembly. This platform still exists. See this previous post. We all know about this performative dimension. And we all love to complain that modern public political debates and campaigns just ‘political theatre’ and ‘all style and no substance’, that ‘spin’, ‘punch-and-judy politics’ and staying ‘on-message’ have displaced something more ‘proper’, ‘honest’ and ‘real’. But I think that complaint is in itself really another piece of simplistic spin from interested parties which ‘we the public’ have internalized. The truth is more complicated and difficult: namely, that conflicting political positions and rival policies often offer up different interpretations of the same evidence or different bodies of evidence altogether. And deliberation towards a decision is difficult, not just because it is hard to disentangle substance from spin or to spot a dodgy argument, but also because we often feel ill-equipped to evaluate and test the evidence presented to support the argument in the first place. Where does the spin stop and the evidence begin? The Greeks of the classical period worried about, and grappled with these questions too. On the one hand they recognized that there were better and worse ways of deliberating towards a decision and they were optimistic about the potential of good public reasoning. They developed an interest in the structure and nature of different forms of argumentation and demonstration and in some cases that interest is directly relatable to the importance of the political assembly and the lawcourt in classical, democratic Athens. In Athens all citizens took part in decision-making: they didn’t delegate decisions to politicians – instead the politicians gave advice to the people. The Greeks also developed an understanding of the importance of what we would call ‘critical thinking’ on the part of individuals who might be members of political council or assembly or a mass jury. On the other hand, these democratic arenas of mass decision-making were highly theatrical and rhetorical in character. Winning a case or persuading the assembly to vote for your policy clearly required orators to put on an entertaining and highly competent rhetorical performance. In this context, where important decisions are derived from the massed citizenry assessing two or more opposed public speeches, we get a tension between two opposed requirements. On one side, the high stakes and related checks and balances in the Athenian council, assembly and courts demanded intellectually virtuous but essentially quite dull forms of proof and demonstration on the part of speakers and sober, considered internal deliberation on the part of the people, the dēmos. On the other hand, we have the theatrical and competitive-performative dynamic of these deliberative venues whereby elite amateur advisers and litigants are pitted against one another before a largely non-elite crowd. The pressure to put on the best act and the difficulty shared by all pre-modern societies of securing compelling or incontrovertible evidence meant that sound and sober reasoning would rarely be enough to win over the crowd. (This ‘evidence vs. performance tension’, as I am calling it, is well-expressed by the various meanings of the Greek word agōn: gathering/assembly, contest for a prize, struggle, legal trial.) I think this performance-evidence tension and the way it is deployed, grappled with, refined and reproduced classical Athenian texts drove Greek literature and thought to realize important new ideas and techniques. This hasn’t been appreciated enough within classical scholarship. And its purchase on controversies and problems in modern normative democratic political theory hasn’t yet been fully recognized either. (Normative = what democracy ought to be. This is often thought to be different to what it is ( = empirical ). Some (but not all) of my future blog posts will talk more about this! This post is taken from the introduction to a public lecture called ‘Deliberation, decision-making and evidence in Classical Greece’, which I delivered on 2nd February at Trevelyan College, University of Durham. The lecture was part of a series of public lectures on the theme of ‘evidence’ delivered by Fellows of the Institute of Advanced Study at the University of Durham. Here is an abstract of the lecture and here is an audio recording of the whole thing. (The lecture starts a few minutes into the recording). This entry was posted in General on 18 February, 2016 by Jon Hesk.